The Camp Fire that overtook the Northern California town of Paradise last week quickly became the most destructive wildfire in state history. Now, with more than 42 dead and hundreds still missing, it is the state’s deadliest. The Camp Fire began on Thursday. Downed power lines likely sparked the blaze, but powerful winds and bone dry conditions quickly turned that spark into a major conflagration. It raced across the landscape, burning up to 80 acres per minute and leaving precious little time for authorities to alert residents in Paradise, a town of 27,000 that stood directly in the fire’s path. When the evacuation alert came, traffic jams quickly clogged the roads heading out of town. Residents fleeing in cars were forced to abandon their vehicles on the road as the fire quickly overtook the town. The fire is still burning largely uncontained, but first responders have begun to sort through the eerie aftermath. In addition to assessing burned houses, cars, and forests, they’ve begun to discover the bodies of victims who were unable to escape the flames. Authorities have accounted for 42 victims as of Monday night, surpassing the 1933 Griffith Park Fire that was formally California’s deadliest. It also became the deadliest in modern American history. Many died in their cars or on the road as they tried to escape the flames. 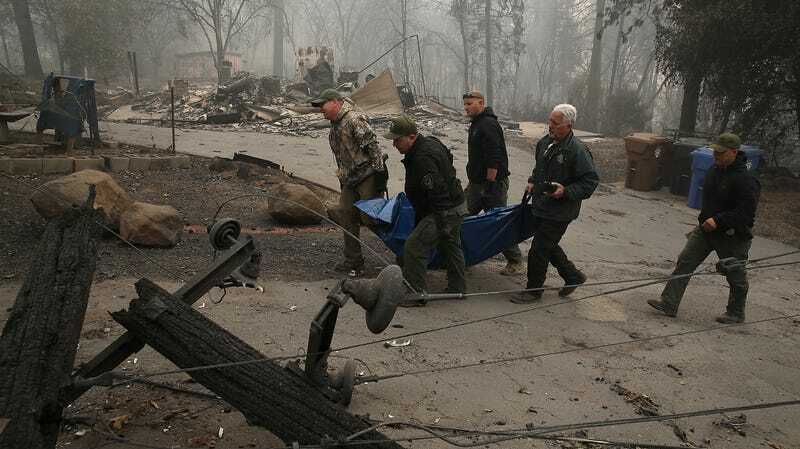 Other bodies have been found in homes where people attempted to ride out the fire or simply couldn’t evacuate. At a press conference on Sunday night, Cal Fire officials said there are still 228 people unaccounted for. The Peshtigo Fire in 1871 is considered the deadliest fire in American history, killing up to 2,500 people. There were of course no phones, TV, or internet to alert people of the incoming blaze or cars to escape it. The Great Fire of 1910 that struck Idaho, Montana, and British Columbia, is another historically deadly blaze. Records kept by the National Interagency Fire Center show that it, charred 3 million acres in the Northern Rockies and killed 78 people, many of whom were firefighters. The blaze set in motion widespread changes for forest management in the U.S., including decades of fire suppression. Those policies coupled with climate change and more people living in forests have in part given rise the dangerous fires we see today. The risks for intense conflagrations are only going to increase as the climate warms further. In any other world, the Camp Fire would be a jumping off point to discuss how these factors interact and how the federal government could help ensure this type of event never happens again. Instead, we’re debunking the president’s cruel and ignorant tweets.